Abagnale, an entangled California sea lion, was finally rescued after evading capture 20 times. After nearly three weeks and 20 rescue attempts, an adult male California sea lion with a fishing line entangled around his neck and mouth was rescued by The Marine Mammal Center in 2009. Abagnale, named after the 1960's con artist Frank Abagnale Jr., who was always two steps ahead of authorities, was originally spotted at PIER 39 in San Francisco on the evening of January 1, and was rescued in Moss Landing Harbor by the Center on January 24. With rescue options dwindling, and the animal's life threatened, the team decided to try something never done before with wild, free-swimming marine mammals. Using darts, veterinarians injected a mild sedative (not a tranquilizer) into the animal to calm and slow him down in order to facilitate a successful and safe rescue. The Center's rescue team, both in the water and on land, were then able to rescue the sea lion and transport him to the Center's Sausalito hospital headquarters. At the Center, veterinarians anesthetized the malnourished sea lion and removed the monofilament nylon fishing line that was deeply imbedded into his neck and mouth. They performed a physical exam on the animal, and administered antibiotics and pain killers. During his 13-day-stay at the hospital, Abagnale ate over 100 pounds of herring. On February 2, veterinarians examined the pinniped again and were pleased to see that the wounds were beginning to heal and that there appeared to be no other complications. 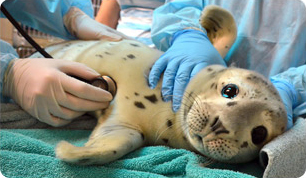 Given his regained strength and healthy appetite, veterinarians felt confident that Abagnale would survive quite well in the ocean and that the saltwater would help his wounds heal. He was released back to the ocean at Rodeo Beach. Abagnale's entanglement story, sadly, is a common one seen at the Center. In 2009, approximately 8% of the 1,702 marine mammals that volunteers and staff at The Marine Mammal Center rescued stranded as a result of entanglement in marine debris. The Center responds to seals, sea lions and other marine mammals that are in need of rescue along 600 miles of coast between Mendocino and San Luis Obispo Counties and through more than 1,000 volunteers and a small staff, provides medical care to each animal admitted with the goal of getting those patients healthy enough to be released back to the ocean. "What's maddening is that you look at the wide array of reasons why marine mammals strand such as illnesses and malnourishment and this one - marine debris - is something we can control if we just change our behaviors and attitudes about how we discard plastics, fishing line and other trash that becomes marine debris," said Jeff Boehm, executive director at The Marine Mammal Center. "We hope people will hear Abagnale's story and make a pledge to eliminate marine debris, and in turn, help marine mammals and the ocean." Entangled in fishing line, then rescued and treated by The Marine Mammal Center, Abagnale returned to his ocean home on February 5, 2010! Update March 17, 2010: Abagnale was spotted resting on Sea Harvest Dock in Moss Landing. He appeared to be in good health and weight! Learn more about California sea lions. Find out how you can help to Stop Trashing Our Oceans. Read more about Our Entangled Patients.